by Victoria Boutenko Author · Gabriel Cousens, M.D. Author of introduction, etc. Why do we overeat time and time again? Why do we make poor diet choices while we want to be healthy? What makes losing weight so difficult? These and many other vital questions are addressed in 12 Steps to Raw Foods in an open and sincere dialogue. Based on the latest scientific research, Victoria Boutenko explains the numerous benefits of choosing a diet of fresh rather than cooked foods. This book contains self-tests and questionnaires that help the reader to determine if they have hidden eating patterns that undermine their health. Using examples from life, the author explores the most common reasons for people to make unhealthy eating choices. 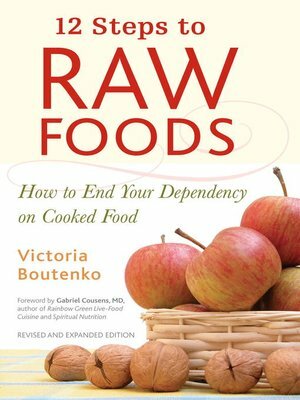 Rather than simply praising the benefits of raw foods, this book offers helpful tips and coping techniques to form and maintain new, healthy patterns. Learn how to make a raw food restaurant card that makes dining with co-workers easy and enjoyable. Discover three magic sentences that enable you to refuse your mother-in-law's apple pie without offending her. Find out how to sustain your chosen diet while traveling. These are only a few of the many scenarios that Boutenko outlines. Written in a convenient 12-step format, this book guides the reader through the most significant physical, psychological, and spiritual phases of the transition from cooked to raw foods. Embracing the raw food lifestyle is more than simply turning off the stove. Such a radical change in the way we eat affects all aspects of life. Boutenko touches on the human relationship with nature, the value of supporting others, and the importance of living in harmony with people who don't share the same point of view on eating. Already a classic, this enhanced second edition is aimed at anyone interested in improving their health through diet.